Our new vocation team (of the Sisters of St. Joseph in St. Louis) had the opportunity to report out to the community the progress of our work after about six months of organizing and doing vocation work. We had four sections of our report. First we talked about the context of vocation work - the fact that there is significant interest in religious life among young adult Catholics. The infographic here gives some of the data. I believe the message is that there are men and women interested in religious life and they are entering our communities. It is true that fewer are entering religious life and we have many older sisters and brothers. Fifty years ago, there was a sharp decline in those coming, but since that time, there has been a steady stream of people seeking to follow a vocation to religious life. The challenge is how to reach out to these inquirers and engage them in a meaningful formation process. Much has changed and will continue to change as our communities adjust to the demographic shifts. How do we shift our mentalities from thousands or hundreds to dozens? What are the challenges, what are the opportunities that this shift affords? And how do we accommodate the simultaneous cultural shift from boomers to millennials? These are challenges we will continue to face for at least a decade. Next, we discussed how we have organized our vocation team. The team is comprised of the last four sisters to join the province, the 'last four in the door'. We bring a great deal of energy and enthusiasm, and a range of skills to the team. We have also invited those sisters in the community who would support vocation work into the process. So we have the four of us at the core of the work, carrying the responsibility for the ministry. Then sisters have volunteered to assist in various ways, or have made themselves available for whatever ways they could help out. That is the expanded team. We will reach out to them regularly with information and updates, as well as inviting them to help with various vocation events. We feel supported and encouraged by these sisters, many of whom have been involved in vocation and formation work in the past. Thank God for the blessings of community. This team came into play in our recent MORE weekend - when we invited young women to share our life for a weekend. Various sisters assisted with welcoming and meals, and they joined us for volunteer ministry, prayer and conversation. It really gave us the opportunity to showcase our community. One of the comments we got was that "you all seem to respect and enjoy one another's company." Yes we do! And it is a gift to be reminded of that by our visitors. 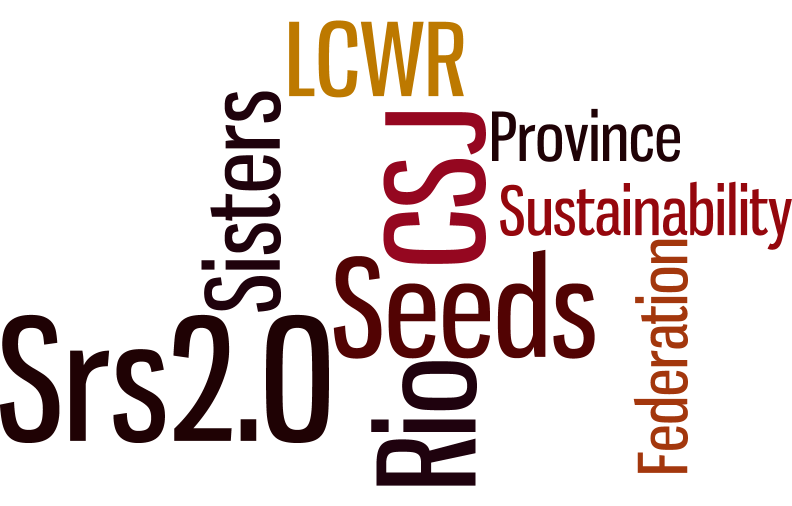 Finally, we officially launched our vocations website: csj.life. One of our early projects was to enhance our social media presence and to set up a web presence dedicated to vocations. We can use it as a platform to showcase the community, vocation events and discernment resources. We have a blog and the four of us are taking turns posting. We are also on twitter @csjlifeconnect, on Facebook, on instagram, etc. So there are multiple ways to connect and to extend our reach. We can also continue to build relationships with those who are seeking more information about life as a Sister of St. Joseph. And so let's add one more layer of vocation team: please pray and support us in this important ministry. Pass our information on to someone you think might be interested, or might make a good Sister of St. Joseph some day. Pray for all of those discerning a vocation and those of us who assist in their journey. I participated in the Sisters of St. Joseph federation event in early July. It was a great celebration and an opportunity to connect with other Sisters of St. Joseph from around the country and some from outside the US as well. I particularly appreciated the "meetings between the meetings" when some of the younger sisters, in various configurations, gathered to share common experience and to dream a common future. Next week, I travel to Atlanta for the national assembly of the LCWR, a gathering of sisters from various congregations from around the US. I am going for work, but it will be another opportunity to meet, share and celebrate. All these gatherings have their specific focus, yet they are all related to the larger movement of religious life and Gospel living. Last night, I was on a web conference with other younger Sisters of St. Joseph, then some sisters gathered to watch the Olympic opening ceremonies together. Always creative and a glimpse into the local culture, these ceremonies were a call to the world community to unite in our efforts for a more sustainable world. I loved the climate change clip, and the follow-up that had each athlete planting a seed that would grow into a long-lasting memorial to the event, and to what we can do together as a world community. It is as simple and as radical, as planting a seed. So many gifts, so many experiences, so many gatherings and networks. "All things work together for the good of those God loves," for the good of each of us.